On Sunday, July 14th, 2013, the racing community world wide lost the king of speed for sit-up bikes in the realm of Land Speed Record racing (LSR). Bill Warner, 44, of Wimauma, Florida, was attempting to break his 2011, world record of 311mph, when his motorcycle became unstable during a record run, and he lost control of the bike. In the crash that followed, Bill lost his life. Bill became the world record holder for his class, APS/BF in 2011, at a race held by the Loring Timing Association. On July 17th, 2011, Bill recorded and official record run of 311.945mph. Bill was the fastest motorcycle racer in the world in his class of “A” partial streamlined bikes with a blown fuel motor. His world record for sit-up, partially streamlined bikes will likely stand for a very long time. Happier days: Bill Warner of Wimauma, Florida made history at the LTA race by achieving a top speed of 311.945 MPH on Sunday morning July 17, 2011. 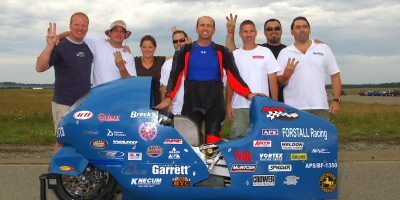 The world record team that put this 1300cc Suzuki Hyabusa on the record books is L to R, Scott Horner, Ken Kline, Trillium Muir, Mark Deluca, Bill Warner, Steve Kenecum, Jody Leveille, and Walt Kudron. Tom McCarthy photo. However, after setting the world record in July, of 2011, three months later in October of 2011, Bill suffered a bad crash at “The Texas Mile” while trying to better his own record. At the Texas event, Bill lost control of his bike when his front tire washed out during a high speed shut down. By his own account of his first accident, Bill’s Hyabusa went into a power-wheelie at over 200mph during a record attempt run and Bill slowed the bike to regain control. On this particular racing surface, where the track transitioned from concrete to paved surface in the shut down area, while Bill had the bike under aggressive breaking, his front tire lost traction at high speed and his bike just laid down on him. Bill went unconscious briefly after the impact and awoke on the race track surrounded by Texas Mile EMT’s working on him. Bill suffered road rash on the left shoulder area and the impact rendered a broken L scapula, four broken ribs, a punctured L lung, contusions of the liver, and two broken fingers of the left hand. He also suffered severe tissue loss due to abrasion of the L foot that required quite a bit of painful work and effort to recover from. During Bill’s fatal crash on Sunday, July 14th, 2013, he was timed at 287mph just before he exited the racing surface on the right side of the track. The run occurred at close to 10AM, EST. Reports indicate Bill was conscious and responding to EMT’s questions as they treated him prior to transport immediately after his crash at Loring AFB, in Limestone, Maine. Earlier in the event, Bill and his team had recorded a speed of 296mph and the bike was stable on that run. In a television interview with local station WCSH, Portland, Warner stated that they had taken power out of the bike to settle it down, and were incrementally creeping up on their power settings to get back to record setting performance. Exactly what happened on Bill’s last pass is not clear at the time of this report. This accident is under investigation by racing officials who shut down the event after the fatal crash.